Orthotics can absolutely benefit children. How so? 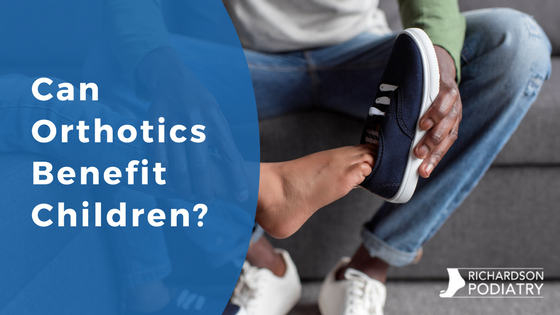 Well, let’s start by taking a look at the two ways orthotics can benefit patients of any age and then we’ll move on to specific conditions children might have wherein we would consider recommending them. Generally speaking, orthotics are either accommodative or functional. Accommodative orthotics are ones often used to deal with structural issues in the feet. They tend to be made from softer materials and can provide additional cushioning in specific areas. Functional orthotics, on the other hand, are used to restrict abnormal motion. Whereas accommodative orthotic devices are generally softer, these are made out of sturdier materials – which is necessary for controlling motion. One particular condition children might have that can benefit from orthotic therapy is flatfoot. Now, not all cases of flatfoot cause problems and need to be treated. When a child is not experiencing pain from the condition, treatment might not be necessary (but we still recommend keeping an eye on the situation with periodic appointments). If flatfoot is either outright causing pain or resulting in overpronation—excessive inward-turning of a foot during ground portions of steps—then a pair of custom orthotics can be used to support the arch at a more natural height. Another condition treatable with orthotics—and especially at an early age—is a bunion. Some people are surprised to learn that children can get bunions, but this is absolutely the case (even if it’s a fairly rare problem for a child to have). Orthotic therapy is quite important in the case of juvenile bunions. For one thing, surgery should be avoided until a foot has reached physical maturity. Perhaps an even bigger reason to prescribe orthotics is the fact bunions are progressive – which means they worsen when left untreated. Orthotics can address existing symptoms and help prevent a bunion from becoming worse. There are certainly other conditions that can be treated with orthotic therapy, but the only way for you to actually know if your child will benefit is to bring him or her in for a visit. When you do, your son or daughter will be treated with gentle, yet effective pediatric foot care. For more information on how children can benefit from orthotics, or to request an appointment so we can treat the source of your child’s foot pain, contact our Richardson, TX office by calling (972) 690-5374. If you’d prefer, you can also fill out the online form found on our website to connect with us right now.